Last Saturday my mother and i went to Nordy's for some serious shopping, which we know can make one work up a good appetite. So we popped into their new cafe which i was really impressed with. The only thing it lacked for a department store restaurant would be the handful of models showing off the latest fashions. (Perhaps that's dating me. Besides, they called that a "tea room", not a cafe.) The waiter brought us a small plate with pickled veggies -- a couple pickle wedges, carrots (my very favorite pickled food) and cauliflower. It was delicious... very mild, and surprisingly no dill. In fact, the waiter was so nice he brought us a second plate. Bring to a boil, and stir until the sugar is dissolved. Obviously you can use whatever you want. It's important not to cook them too long; you want them snappy. 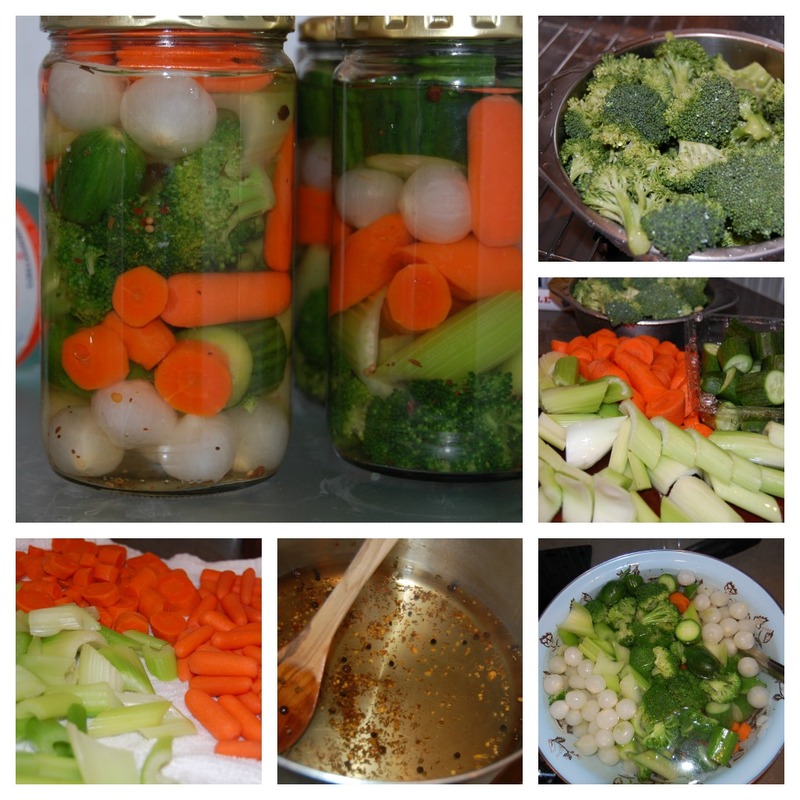 I blanched them in boiling water, as follows: Carrots for 4 minutes; broccoli and celery for 2 minutes; persian cucumbers and pearl onions just "took a dip" and immediately took them out of the boiling water as quick as they went in. Other veggies to try are: cauliflower, string beans, and hearts of palm. Immediately after you take the veggies out of the boiling water, put them into an ice bath so that they keep their vibrant color. After the ice bath (as little as a few minutes, otherwise you can keep them in until finished with the entire cooking process), lay them on clean towels to drain. I found the broccoli was like a sponge, so i gently pressed out the water the florets held. 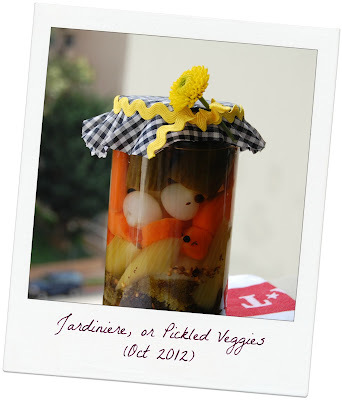 Put the veggies in jars... mixed up... individually... whatever way you want. Then, pour the marinade directly on top. Then you have the fun of figuring out what kind of hats to put on your jars. Carrots taking an ice bath... quite relaxing. I enjoyed these, although they were a little sweeter than i wanted. Next time i'll definitely use real sugar, just not as much. Don't forget to make your veggies an adorable hat. 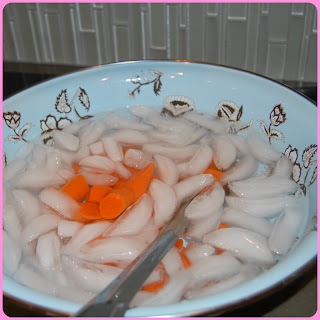 Are you as brave as the carrots... an ice bath?